As 2015 comes to a close, I look back at all the interactions I have had with so many of you over the last year and I am so thankful to share the photography passion with all of you. And when I say "share" and I mean a two way path of communication. I am equally inspired by all the other photographers out there, regardless of whether you are a professional or just someone who loves taking and sharing your photos. 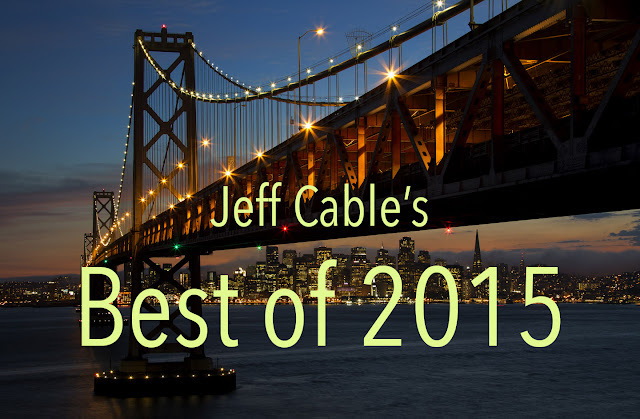 As I do every year, I have posted my "Best of" video looking back at the year. More importantly, I am VERY excited about the coming year. 2016 will include big trips to Africa (less than two weeks away) and Rio for the Summer Olympics. I have looked at countless web sites and images over the last year and very excited to see what you all are doing. Keep up the great work and turn up the passion for 2016! You are probably wondering why, since this blog is usually all about photography, I would want to review a Wi-Fi doorbell. Well...guess what? 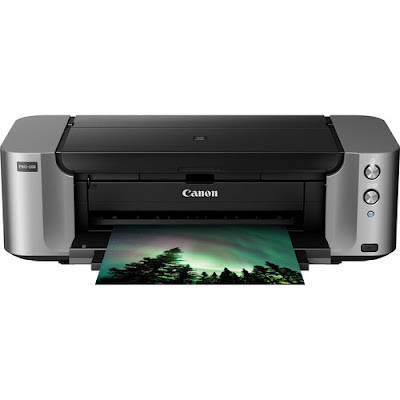 This product is really useful for all of us photographers who order products to be shipped to our house. For the last couple of weeks I have been watching the news about all the packages that are being stolen from the front doors of people's houses. At the same time, I was expecting some new photo equipment to be shipped to my house and not very happy about the thought of expensive photo gear being left in front of my house for hours. I was talking to a friend of mine who had just ordered a new WiFi doorbell. As he described it to me, I thought it would be the perfect thing to have at my house. Not only would it give me some control from any remote location (to be described in a little bit), but from what I am hearing, the police recommend this product as an excellent deterrent to potential criminals. I researched the different models that are available and decided that the Ring Video Doorbell looked to have the best features and functionality. The product sells for $199 and can be found online. 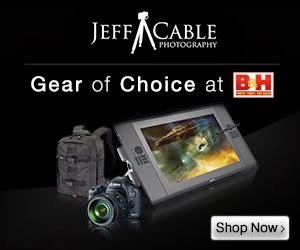 As I was writing this blog, I just checked and to my amazement, B&H Photo sells this product. You can find it here. If I had known, I would have bought it from them. Five days later and I got my Ring to install. So...what is a WiFi doorbell and why would you want it? 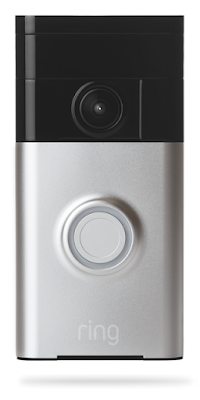 The Ring Video Doorbell connects to your home WiFi and notifies you (via your iPhone or Android device) any time someone rings your doorbell. You can even set it up to notify you any time someone walks up to your front door. The Ring has a speaker and microphone built in so that you can communicate through it. This means that you can talk to the person at your front door whether you are home or half way around the world. For most people, this solves a big problem. Now you have the ability to know when someone delivers something to your house. You can either direct the delivery person to put the package somewhere else, or drive home to put it in a safe place. In my case, I also have the ability to open my garage door remotely, using my WiFi garage door opener. Using both products, I can ask the delivery people to ring my doorbell. Seconds later I get a notification on my phone and see a video of them at the front door. I can ask them to wait a couple of seconds, open my garage door, have them place the package in the garage, and then close the garage door. All from anywhere in the world. Pretty fancy! Now the big question - would it work as advertised? The first thing I had to do was replace my ancient doorbell with this new one. I opened the box and was immediately impressed with the packaging and instructions. It reminded me a lot of Apple packaging, straight forward and clean. The doorbell was a little larger than I thought it would be. I was hoping that it would be 25% smaller than it actually was. But nonetheless, it looked nice enough. Installation was almost too easy. I just removed the two wires from my old doorbell and attached it to the mounting plate of the Ring Doorbell. I then used the tiny level (which Ring conveniently includes in the box) to level the plate and drill holes for the screws. Once this back plate was installed, I then paired the doorbell to my iPhone and mounted it to the plate. I ordered the Satin Nickel color, but there were numerous other colors to choose from. There are two proprietary screws which hold the doorbell to the mounting plate, and they make it harder for someone to steal the product from your house. I put those in and I was done. That easy! After the physical installation was done, I then went to the Ring application on my iPhone to customize some things. 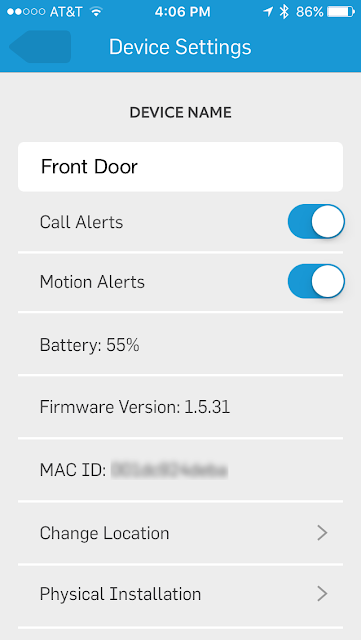 I named the doorbell as my Front Door bell and left on the Call Alerts and Motion Alerts. After watching the video instructions (which were clear and easy to understand), I customized the area and sensitivity of the motion sensor. I purposely turned off the zones to the far right and tightened the distance of the zone, since the camera and sensor are VERY wide angle and I did not want cars and people walking on the street to trigger an alert on my phone. All of this is done by selecting the area with your finger on the display. After 20 minutes of setup, everything was complete and it was time to test out the Ring Video Doorbell. And it is working perfectly. Here is a screen shot of the video of my wife and my daughter testing it out. The notification time between the press of the doorbell and the notification on the phone is a matter of seconds, and the HD video quality is quite good. They have the ability to store all the alerts and videos in the cloud, so that you can go back and review them from months past. The price is reasonable at $3 a month, so I will probably opt for that after the 30 day trial is up. I am really happy with this new product and would recommend it highly to anyone concerned with deliveries being left in front of their house and home security in general. Again, here is the link to this really cool product. On Saturday night I photographed the San Jose Sharks hockey game against the Minnesota Wild. The Sharks are my home team, but I also have good friends on the Wild team, so it was great to capture photos of the game but also see some friends who I have not seen in a while. In this blog post, I am going to show you some of my favorite photos from the game in sequential order. I got to the rink around 6pm for the 7:30pm start time. I set my equipment downstairs, under the arena, in the press room and got a chance to hang out with some other photographer friends for a little bit. I brought a bunch of different lenses, since I was not sure where I would be shooting from. As it turned out, I mostly used my Canon 1Dx with the Canon 70-200 2.8 IS II lens. I made my way out to the tunnel , but not before getting this photo of the Wild team coming out of the visiting locker room for warm ups. I then went over to the Sharks side and photographed the players warming up. This gave me a chance to get some individual shots of the guys, and also gave me some warm up time shooting. Just like pro athletes, it si good for us photographers to get in the zone as well. Before the Sharks come off the ice after warm ups, they always gather in front of the net and shoot against the goalie one last time as a team. While I was shooting warm ups, I saw Joe Thornton's wife and kids come through the tunnel and stand by the glass. I have known them for many years now and had a chance to chat while shooting. After the guys were done with warm ups, I went back through the tunnel to see Joe coming out of the locker room to greet his kids. I quickly grabbed this and some other shots to send to them. When shooting from the corner position, the hole in the glass gives a pretty limited range of shooting, but if I lean hard enough, it allows me to get a view straight down the ice with a view of the benches. Here is a shot of Tomas Hertl working the puck in front of the Minnesota bench. All the game shots were taken with the 70-200mm lens. Brent Burns had a great scoring opportunity in the first period, but as you can see here, the puck rang off the left cross bar. The Sharks could really have used this goal! And here is Brent Burns working the defense. I love that caveman beard and toothless smile. That attention to the puck paid off here. It looks like the puck is going in the net, but it was redirected away from the goal by Martin Jones. Mikael Granlund taking a shot on goal. A face off in the defensive zone, right in front of my shooting position. ...and look who I saw in the stands. Of course, Santa is a Sharks fan. Then I went back to my shooting position to capture the action of the third period. Then, not long after the Sharks offensive push, the wild scored to break the 0-0 tie. You can see the Minnesota team celebrating and the dejection in the face of the Sharks players. (Both of these two shots of the goal and celebration were taken with the Canon 70-200mm lens zoomed all the way out to 200mm and then cropped to give you this view. Joe Thornton taking a shot on goal. Tomas Hertl trying to tie up the score late in the third period. Patrick Marleau watching the play in the offensive zone. Here is a tight shot (crop) of Darcy Kuemper as he skated towards me during one of the breaks. The Wild scored an empty net goal to beat my home team 2 to 0. As a photographer, it is our job to tell the story, so I took photos of the Wild teammates congratulated each other on the shutout. This last shot shows me at my hole. And no, I am not shooting at this moment, because the players are too close for me to focus with the 70-200mm lens. Normally I would have another camera body with a fish eye lens to capture these close shots, but I decided to stick with one camera for this shoot. Thanks to Kyle Terada - USA TODAY for taking and sending me this photo. 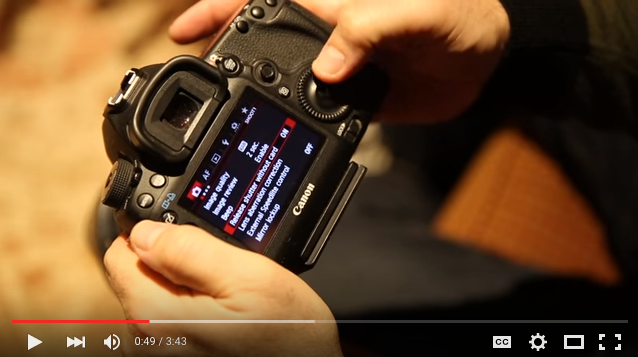 Comparing the new Canon EF 16-35mm f/4 USM IS lens to my older Canon EF 16-35mm f/2.8 II USM lens - Should I switch? A little while back Canon announced a new Canon EF 16-35mm f/4L IS USM lens and my first thought was, "I don't need that since I have the Canon 16-35mm f/2.8 version." But then I started hearing from others that the new f/4 lens was sharper than the f/2.8 lens and this got me thinking that maybe it was time to switch. Well...my good friends at Canon were nice enough to loan me the new f/4 lens so that I could use it for a couple of weeks to see if it were worth making the switch. Here are the two lenses next to each other, with the newer f/4 lens on the left. Assuming that you have read other reviews from me, you know that I am not the type of person who wants to look at graphs and charts to determine if a lens is better. I want to take it out and give it a real world try! Since I had a couple of events to shoot, I removed my 16-35 f/2.8 lens from my rolling bag and replaced it with the new f/4 loaner from Canon. Here is a shot taken with the Canon 1Dx and the new f/4 lens. I was wondering if the loss of light (not having 2.8 as an option) would effect the images, but this was not an issue. I typically shoot at a high ISO, if needed, and use the Canon 600EX-RT flashes to add additional light. This image was taken at an ISO of 640 in order to maintain the colors in the dance floor. The remote flash helped freeze the DJ even at a shutter speed of 1/40th of a second. And for those of you wondering why everyone is relatively sharp, even when taken at a wide aperture of f/4, wide lenses provide a wider depth of field. The new f/4 version of the 16-35mm lens also has image stabilization, which the older lens does not have. After shooting with the new lens for a couple of events, I decided to mount my Canon 5D Mark III up on my tripod and do a side-by-side test to compare them in a controlled environment. The first thing I noticed when comparing the images side-by-side (using Photo Mechanic), is that the older 16-35mm was able to shoot slightly wider than the new lens at 16mm. Notice how, even with the camera mounted in the exact same position, you can see the handles of the drawers on the image to the right (the f/2.8 lens) but not in the image on the left (the f/4 lens). This is not a huge deal for me, but I found it interesting that 16mm is different on the two lenses. If you look at the bend of the image, you will notice that both lenses have about the same amount of distortion. You can see the distortion in this photo, with the girl's foot (on the left) looking out of proportion compared to the rest of her and the others. In some situations, this is problematic, but can be corrected in Photoshop. In this case, I like the distortion and feel that it makes the photo more interesting. I then rolled the zoom for both lenses and compared the images at 35mm and felt that they were comparable. When zooming in and looking closer, you will notice that at f/4, the older lens (on the right) is sharper than the newer lens. At f/22 the clarity was comparable and almost indistinguishable between the two. One thing that I did not expect was the difference in focus between the two lenses. With the newer f/4 lens, I could focus on the helmets at 16mm, and then zoom into 35mm with almost no loss of focus. With my older f/2.8 lens, when I zoomed in from 16mm to 35mm, this is what I got. The image was wildly out of focus! This is a clear advantage for the new lens. * First and foremost, the f/4 lens costs $500 less than the f/2.8 lens. If the price was similar it would be a difficult decision, but for anyone looking for a great wide angle lens, I would recommend the f/4 since it is equally sharp in most cases and costs less. 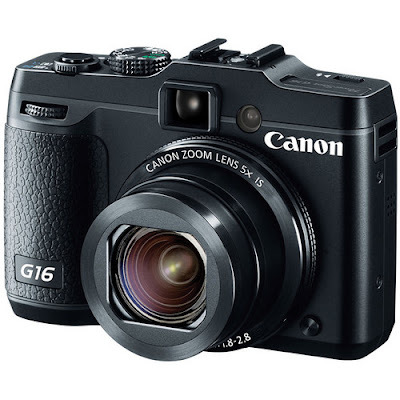 * The lens has Image Stabilization which is always handy for those slow shutter shots. It is less important on a wide lens, but still an advantage. * The lens is very sharp from the center to the outer edges of the frame. * This new lens has a diameter of 77mm (vs 82mm in the older lens) which I really like. Since most of my other lenses are 77mm diameter, this means that I could use all of my existing 77mm Tiffen HT filters. * The f/4 lens is only slightly lighter than the f/2.8 version, but feels better balanced (less front weighted) in your hands. If you are like me and already own the Canon 16-35mm f/2.8 lens, it is probably not worth switching to the new f/4 lens, but if you do not own the f/2.8 version or are looking to upgrade from the Canon 17-40mm lens, I would highly recommend the new Canon 16-35mm f/4 lens. You will save money and have an excellent wide angle zoom lens in your arsenal.